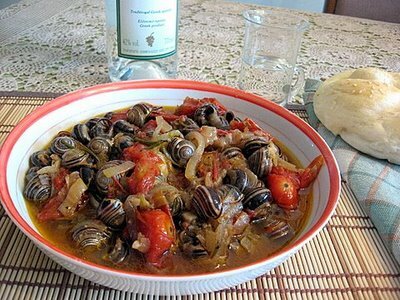 Garden snails are a specialty on the Greek island of Crete, where they are traditionally enjoyed in huge quantities in August. 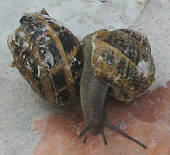 Before cooking, the snails need to be cleaned and washed. 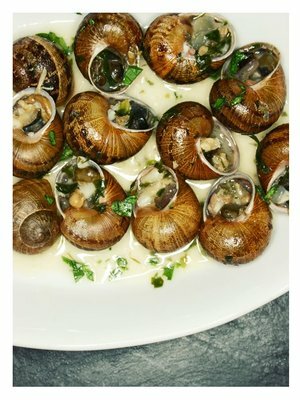 Here’s how to do it, working with snails one at a time. With a sharp knife, remove the membrane covering the opening in the shell. 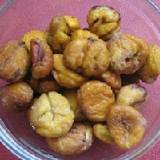 Put snails in a large pot, pan, or dish with plenty of fresh water. If any snails float, throw them out. Take 2-3 snails in your hands and rub with fingers. Set aside when finished. When the snails have been cleaned once this way, throw out the water, and repeat, starting with fresh water. Rinse well, and use in your favorite recipe.